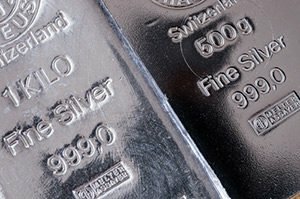 The price of silver had a strong start to last week just like its golden cousin. I was very impressed to see silver prices shoot all the way up to $14.80 on Tuesday, Oct. 23. That was a blistering gain of nearly 2% from the previous day's close, and a silver's highest level since late August. What triggered so much buying? In my view, it was heightened concerns about geopolitics and a weaker dollar that tipped the scales. Bond yields dropped as new buying emerged. That caused the 10-year treasury yield to dive to 3.13% and the U.S. dollar index to consolidate near 95.8. The silver price did pull back slightly after that, but it remained stronger on balance than it had been for the previous couple of weeks. Like I pointed out, Tuesday's action was a big move in silver prices. Silver went from $14.53 at Monday's close to $14.80 by around 9:30 a.m. There was a big sell-off in stocks; the Dow fell 500 points (about 2%) thanks to concerns about earnings and geopolitics. More specifically, the EU told Italy its budget proposal was unacceptable and insisted on a revision within three weeks, while Brexit negotiations continued through a rough patch. 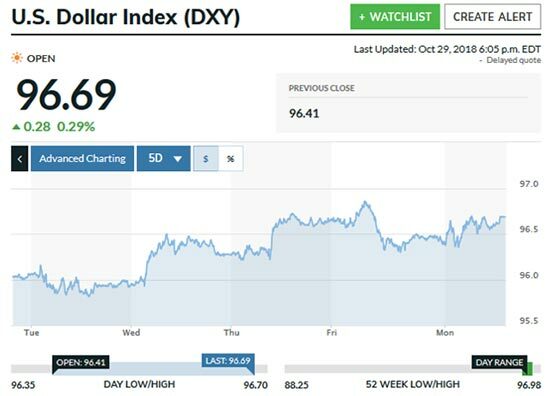 On Wednesday, the dollar index jumped quickly from 96 to "test" the 96.5 level through most of the day. It would end near 96.35, but equities took a deep dive with the S&P 500 losing 3%, the Dow 2.4% and the Nasdaq a big 4.4%. Unlike gold, the price of silver dialed back, but stayed above $14.60 and ended at $14.65. Thursday brought more weakness as the DXY jumped again, this time to about 96.65 though the second half of the day. The driver was most likely thanks to the ECB leaving rates unchanged and Draghi promising accommodative policies. Equities regained some strength, but silver dropped to $14.57 before clawing back slightly to close at $14.61. On Friday, the dollar reversed, dropping 50 basis points from 96.85 to 96.35. Silver bottomed just after 8 a.m. at $14.55, then rallied quickly to $14.73 before dropping to $14.65, where it closed. Monday's action saw a rally to $14.71 just after 8 a.m. But that quickly reversed, and silver fell to $14.39 before climbing back to close at $14.41.